an encasement for the foot; a protective casing or sheath. Gibney boot an adhesive tape support used in treatment of sprains and other painful conditions of the ankle, the tape being applied in a basket-weave fashion with strips placed alternately under the sole of the foot and around the back of the leg. Unna's paste boot a dressing for varicose ulcers, consisting of a paste made from gelatin, zinc oxide, and glycerin, which is applied to the entire leg, then covered with a spiral bandage, this in turn being given a coat of the paste; the process is repeated until satisfactory rigidity is attained. (bldbomact) an encasement for the foot; a protective casing or sheath. Gibney's boot an adhesive tape support used in treatment of sprains and other painful conditions of the ankle, the tape being applied in a basketweave fashion with strips placed alternately under the sole of the foot and around the back of the leg. 1 a shoelike prosthetic device for holding a leg or arm during treatment. 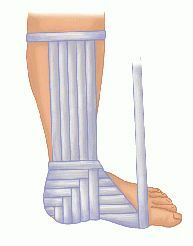 2 a basketweave bandage that covers the foot and lower leg. 3 an airtight device in which the arm or leg can be inserted and the air pumped out, creating a partial vacuum to divert blood flow from the surrounding area. Informatics verb To load the operating system–eg, Windows, OS X into the computer's RAM or main memory, after which the computer can run applications. See Random access memory. A shoe, brace, or restrictive bandage used to protect and immobilize the foot and ankle. a rubber cover worn over the hoof by pacing and trotting horses to prevent damage to the inside of the opposite cannon bone. Called also bell boot.